Texas is home to many different predators such as mountain lions, bobcats, coyotes, grey fox, red fox, badgers, raccoons, and ringtail cats. In addition, there are many species of varmints such as; skunks, prairie dogs, porcupines, feral cats and jackrabbits. The State of Texas allows "Predator and Varmint Hunters" the ability to hunt from a vehicle or ATV. They may also hunt either day & night. They may even use night vision & suppressors on their firearms! There is no closed season for predator hunting. Hunters may hunt year round, filling the long void between regular hunting seasons, while providing fun opportunities for the entire family to enjoy. Hunting licenses are inexpensive and available "over the counter" at the "Magnum Guide Service Lodge" since we are a licensed vendor for the State of Texas. Since the collapse of the fur market in the early 80's, predator numbers are now at record populations. Under Texas law, hunters may shoot as many predators and varmints as they choose per day, but they may only reduce one of each species of "fur-bearer" (racoon, fox, ringtail cat, badger) into possession per day, unless they have a Furbearer's License. However, there is no bag limit or possession limit for "non-furbearing animals" (mountain lions, bobcats, coyotes). Bobcats must be "sealed" with a locking "Cites Tag" before crossing State lines. 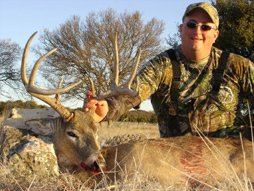 Magnum Guide Service is a registered "Sealing Station Agent" for the Texas Parks & Wildlife Department. At the ripe young age of 14, Jim began fur trapping, predator calling, and hunting raccoons with hounds for "Christmas Money." Jim has spent 42 years sport hunting predators and 32 years guiding Predator Hunters "fulltime" from around the world. The hunters he has personally guided now numbers in the thousands, just check out the article in Predator Extreme magazine. His "calling" and "hunting skills" have enabled him and his hunting partners to place in the very top of several predator calling contests. Magnum predator hunter's consistent high level of success is a direct result of a lifetime of experience gained from hunting predators in Africa, Canada, Mexico, Alaska, Colorado, New Mexico, Nevada, Texas and Wyoming. Jim's secret and time proven calling techniques has been taught to the staff of guides at Magnum Guide Service. 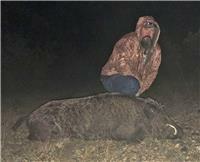 This has launched "MGS" to be one of "the" premier destinations for serious predator hunters. 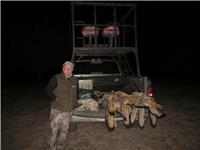 Our ranches total over 150,000 acres and continue to produce high quality "action" for our "Magnum Hunters". 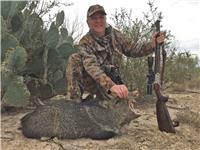 Additionally, our hunters may often times combine their predator hunt with; javelina, feral hogs, free range aoudad sheep, free range elk, whitetail deer, mule deer, exotic big game and turkeys. Let us customize a trip for you! 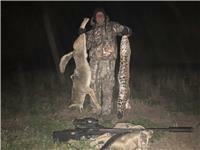 While we can hunt either day and/or night, the majority of our predator hunting is at night. This is because most predators are nocturnal and prefer hunting themselves at night. This helps to improve our hunter's overall predator hunting success, especially on bobcats since they respond better to calls at night. Our primary method of hunting is via 4WD trucks. We have three customized 4 door, 4WD trucks that are each equipped with 11 foot high custom shooting platforms. Two of the high racks are equipped with two swivel shooting chairs and one additional seat for the guide, while our newest custom high rack boasts four swivel shooting chairs and one center chair for the guide. All of the railings are completely padded and provide a 360 degree shooting rest. In addition, we have a Jeep and a 6x6 Polaris Ranger for hunting more remote areas. 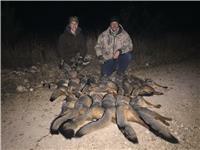 We utilize FoxPro electronic digital calls along with an assortment of mouth blown calls. Our guides work the "calls" while shining a dim red light searching for the reflective glow of incoming eyes. Once a predator is located, our guides will tap the hunter on the shoulder to let them know that a predator is on the way. When the predator stalks within gun range, our guides will "light em up" with a powerful spotlight providing the hunter a "visible" shot. Shooting distances will vary according to terrain and specie. A well choked 12 gauge shotgun is effective for running shots out to 40 yards while small caliber rifles such as a .222, .223 or .22-250 are best from 40 yards and out. Daytime hunts are much like any other hunt whereby you hunt both early morning and late afternoons in full camouflage. Food, lodging, guide and in most instances transfers from the nearest airport depending on which ranch or state we are hunting. Shipping of hunter's trophies or transport of hunter's trophies to local taxidermist is available for a small fee. Magnum Guide Service offers youth discounts on many of its hunts helping to make predator hunting family friendly and affordable for all to enjoy! Gun rentals are available. Personal hunting equipment, gratuities for the staff, adult "spirit" and wine beverages, personal hunting license, expediting of trophies and or taxidermy services.